MICHAEL MORECI is a novelist and author of comic books, who was recently named in Newcity Lit's "Lit 50: Who Really Books in Chicago 2018." His comics include the critically acclaimed sci-fi trilogy Roche Limit and the military horror drama Burning Fields. He's also written Suicide Squad for DC, Planet of the Apes for Boom!, and his other original titles include Curse, Hoax Hunters, ReincarNATE, and Black Hole Repo. As a novelist, Michael is the author of Spy Swap, an espionage thriller for Tor/Forge. He lives in Chicago with his wife, two sons, and dog. "Stirring....Moreci’s story wears its antecedents proudly, from the Star Wars–crawl–style opening and flashback prologue to the talk of controlling mystical energies by truly knowing oneself. 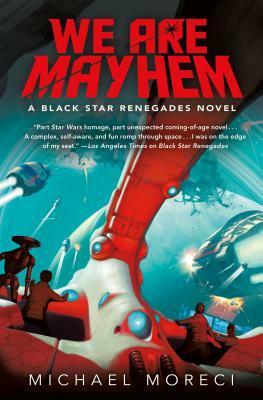 The novel is an even blend of high-energy battle scenes and trenchant moments of character interaction as heroes dive into 'fighting for what [they] believe is right.' Returning readers and fans of intrigues and battles will enjoy this brisk space adventure series."